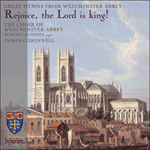 Henry Purcell wrote the anthem O God, thou art my God (Z35) between 1680 and 1682 whilst he was Organist of Westminster Abbey. Its closing ‘Alleluia’ section was adapted as a hymn tune by Canon Ernest Hawkins in 1842, and included in Belville’s collection The Psalmist the following year. Henry Purcell is buried in the North Quire aisle very near to the spot where the organ was situated in the seventeenth century. The anonymous seventh-century text Angularis fundamentum found a champion in the scholarly priest John Mason Neale, a central figure of the early Oxford Movement. Acknowledged as the best in his year at Trinity College, Cambridge, Neale began to reflect on the important role of architecture in illustrating theological and liturgical principles—the fruits of which conviction are seen in the descriptive and comprehensive translation of this hymn. An avid writer of Church history, apologetics, and catechetics, perhaps his greatest contributions to the liturgical life of the Church were his translations of the sixth-century theological poet Venantius Fortunatus. Neale disliked the tendency in his contemporary Methodist hymnodists towards sentimentality and sensuality in much new hymnody, preferring hymns which educated people faithfully in doctrine and dogma. A committed antiquarian, his 1851 collection Medieval Hymns and Sequences included translations in their original metre, so that they could be sung to their old tunes. This hymn was sung at Princess Margaret’s wedding to Antony Armstrong-Jones in Westminster Abbey in 1960, and at the ecumenical Evening Prayer celebrated with Pope Benedict XVI in September 2010. Shed within its walls for aye.